Do you have a list of priorities or goals that you want to achieve this year? And do you struggle with allocating time to them? I’m no different. Life can be messy. Most of us juggle a lot of different things at the same time. Even though the simple solution is to stop juggling, it’s not always realistic. Or even needed. What if you could do more things without losing your time? It’s possible. But you must work in an organized way. Enter: Time Blocking a simple productivity exercise that many people use. It’s not fancy or revolutionary. The only thing you need is a calendar, which is something everyone with a smartphone and computer has. But Time Blocking is more than just a productivity tool. It’s about self-awareness. The road to high productivity starts with awareness. For instance, one of my priorities this year is to write a book on pragmatic thinking. However, there’s a problem: I haven’t been writing. How did I come to this conclusion? I simply looked at my list of priorities for 2017, and I then I looked at my calendar. Yes, I do. I’m not some kind of supercomputer that remembers everything. I’m a regular human being. I think of something to do, start working on it, life gets in the way, and then I FORGET about it. It happens to all of us. We need self-awareness and tools that keep us in check. And that’s why I like Time Blocking. Some people love Time Blocking. Some people hate it. The last sentence is exactly why I schedule everything I want to do. Working is not the same thing as making progress. 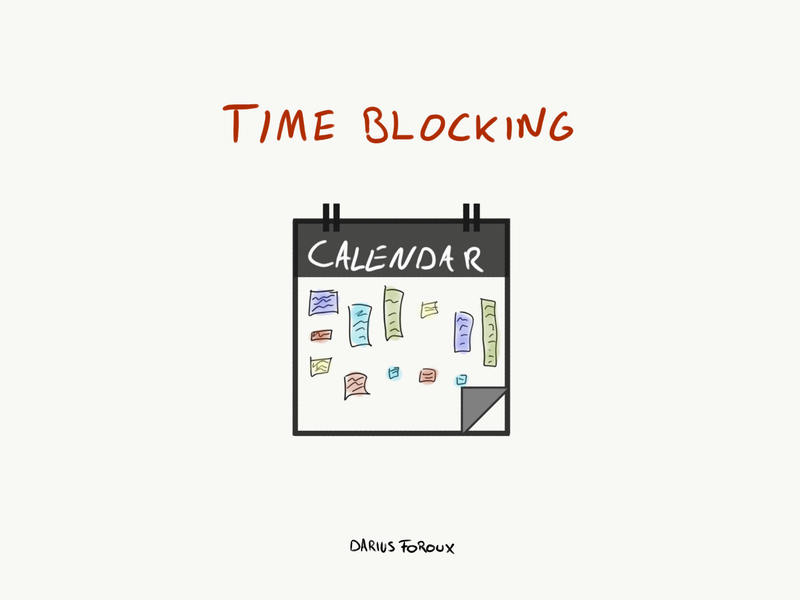 And Time Blocking helps me to improve my focus so I can get meaningful things done. Things that have an actual impact on my life. I know there are a lot of successful people who work with empty calendars. I’ve read the articles. They simply work two, three or four hours per day. And to be honest, that sounds very attractive to me too. However, one must look at his/her own life situation. And more importantly: What resources do you have? Often, people who don’t have a lot of money, do have a lot of time. So why not use it wisely? Either way, I think that planning serves a purpose. I plan my days and weeks in advance because I want to make sure I’m working on the RIGHT things. Too often, I get lost in completing daily tasks. Think about it this way. I’m pretty organized already. And I only work on one big thing per area of my life. But there are many different areas of my life: My family business, my blog, podcast, online courses, relationship, friends, investments, etc. It might sound like I’m doing many different things. But it depends on how you look at it. Everything I do leads to one thing: Living a meaningful and independent life. But let’s not get philosophical here. If you’re lacking focus, not making progress, and want to work in a more organized way, give time blocking a try. Take 10 minutes every evening and plan your next day. Rearrange blocks if you must create time for other important things. Use recurring blocks for recurring tasks. For instance, I’ve scheduled two hours to write my new book every Tuesday and Thursday. Don’t over-schedule. Realistically, you can’t be productive 10 hours straight. Give yourself some time between tasks. And always schedule more time than you think you need. No problem. Plan less. There’s always a counter-movement for everything. People who do the exact opposite and advocate an anti-productivity lifestyle. You know, folks who claim they have empty calendars and give zero fucks about everything in life. People who pretend they are always “enjoying” themselves. They like to go with the flow and daydream. You know what that reminds me of? Those kids in school who always said, “Ah dude, I didn’t have time to study for this class,” but always ended up getting straight A’s. People just want to make you believe they don’t work hard. It’s a facade. And when they do well in life, it seems like it came easy. As far as I know, achieving meaningful things is hard. I don’t think there’s anything cool about pretending it’s easy. Nor do I believe that it’s cool to work yourself to death. I often think of this question: Are you an amateur or a pro? It’s Steven Pressfield’s famous analogy, from his book The War Of Art, for getting work done.